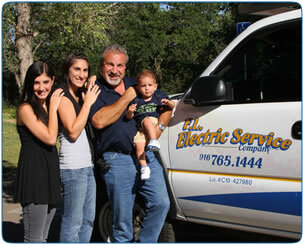 We specialize in FAST & AFFORDABLE electrical repair and installation service for the Sacramento Region. With 30 years of experience as electrical contractors in the greater Sacramento Region, we know how to get the job done right, on time, and on budget. Professional commercial electrician service and repairs for office buildings, restaurants, retail stores, and warehouses. Locally owned and operated for 30 years as a licensed, Sacramento Electrician. Whether you are a homeowner or commercial property manager, safety and service are critical when hiring an electrician. We pride ourselves on our 30 year reputation of expert electrical repairs and fair prices. Fast: We understand that electrical matters need immediate attention. Most basic repairs are completed in the first hour, and for emergency situations we offer 24 hour service. Affordable: Our formula for success is offering fair prices with great service. Without the expensive overhead the "big companies" have, we can pass along the savings to you. Safe: Protect your home and your family by hiring a licensed, professional electrician rather than a part-time handyman.